The season is only a month away and your turkey is gearing up for it. Hell, given my travel schedule in August and the impending 2016 Greater Orlando Heart Walk (have you made your donation? ), I figure it is now or never! Which way will the ball bounce? When #18 Michigan (5-0, 1-0 B1G) invades whited-out Beaver Stadium, which version of the Wolverines will the Nittany Lions see? Will it be the Victors who trounced Notre Dame 41-30 or the Schmucks who rested on the laurels of that win while they damn near got licked by the likes of Akron and UConn the following two weeks? At Penn State (3-2, 0-1 B1G), no one is really sure what to expect. You can tell this will be an unpredictable, screwball game by all the head-scratching commentary you see in the media. As if this turkey didn’t go down in flames badly enough trying to predict the Indiana game last week, here’s another one for me to screw up! Augmenting the projected mysteriousness of this game, O’Brien says he plans to use a broader range of players in this game, perhaps increasing the use of Akeel Lynch and Adam Breneman, “depending on how they do in practice from Monday to Thursday.” That’s good, although it probably doesn’t hit at the heart of the Penn State’s offensive problems, which include a rookie quarterback, a half-assed offensive line, and the lack of reliable fullback. We’ll also probably see plenty of the hurry-up “NASCAR” offense. Penn State is in the middle of the FBS pack at #67 in rushing yards gained, which must turn northward before anyone can anticipate any significant degree of success at all in Big Ten conference play. B1G run defenses are just too good. Michigan ranks 9th overall in the FBS division and 4rd in the B1G in stopping the run, allowing a paltry 90.4 yards per game and NO rushing TDs. Beyond Michigan, PSU faces B1G defensive giants OSU (ranks 7th overall against the run) and Wisconsin (ranks 12th). In all, five B1G teams are in the top decile of the FBS in rushing defense, and PSU isn’t far behind at #20. However, you never know with this team. Indiana had a statistically crappy run defense (they rank #107), but they held PSU to lilliputian yardage. I’ll give the edge to Michigan against the PSU run. Now, what about the pass, you ask? Well, hell, everybody has been putting their hopes behind the boy wonder, Christian Hackenberg, which is at once unrealistic and unfair. Here we’ll have a kid playing in front of a huge, homecoming crowd with lofty expectations of him, coming off a decent but erratic, freshmanlike performance against Nativeamericaniana. It doesn’t help that he has an unreliable offensive line in front of him. Fortunately, Michigan is averaging only two sacks per game, but we can expect to see Hacky hurried a lot, especially if linebacker Jake Ryan, who has been medically cleared to play, actually does take the field. Penn State has allowed 2.2 sacks per game against lesser defenses. Michigan also has the 20th ranked pass efficiency defense. When Michigan has the ball, much ballyhooed dual-threat junior quarterback Devin Gardner has taken over the QB reins from “Shoelace” Denard X. Robinson, now playing for the hapless Jacksonville Jaguars and listed as an OW — Offensive Weapon. Gardner can get into turnover mode and is thus vulnerable if and only if Penn State’s vaunted DL can contain him. Let him out of the pocket and all hell breaks loose. Hurry him in the pocket and he throws interceptions. He’s thrown eight INTs thus far this season, equaling the number of TDs he’s thrown. However, when he’s on target, he has a 60% completion rate to his own guys; what’s worse is that he is a holy terror hoofing it in the open field. He’s had two 100+ yard rushing games this year and is averaging over 63 yards per game on the ground. He must be contained or the game can quickly get out of hand — and you know what happens with this team when that happens. Gardner is also a deep passing threat, and against PSU’s sucky secondary, that could also spell trouble. Just trying to put things in perspective here. Everything has a Kevin Bacon/Nittany Turkey connection, and so it goes in the Big Blue passing game. Gardner’s big target (and I do mean big — 6’5″ 228) is sophomore tight end Devin Funchess, from Farmington Hills, Michigan, a town in which this turkey lived while managing a long-term consulting job in Detroit. Devin-to-Devin — what a concept! Funchess has 15 receptions for 296 yards and two touchdowns this year, averaging 19.7 yards per game. The other half of the major pass receiving duo is senior wide receiver Jeremy Gallon, with 24 receptions for 367 yards and four TDs. Gallon is actually a 5’8″ half-pint who was a scholastic star in my neighboring town of Apopka, FL, from whence many fine football players including All-Pro Warren Sapp emanated. These two receivers have accounted for well over half of Michigan’s passing output for 2013 and all but two of the passing touchdowns. Aside from Gardner, the feature back responsible for a major share of Michigan’s rushing yards is senior Fitzgerald Toussant, with 397 yards on 96 carries and 7 touchdowns. His big game was against the nonexistent defense of UConn, where he had 120 yards and two TDs. As we’ve discussed before, absent internal leadership within the team, the chores of keeping morale high and motivating players to perform up to their ability (not 110% :)) falls back to O’Brien and his staff. Once I visited Manchester United game, and that was quite a game in terms of internal leadership. If you are wondering where to buy Man U tickets, check out some internet resources. At his presser, O’Brien said that the team’s confidence wasn’t shaken. We’ll see. In the aftermath of a big loss to Indiana, the psychological conditioning angle is on the front burner for this turkey. We noted the very obvious negative body language — particularly on the defense — in the second half of the Indiana game, especially after IU scored 21 straight points. These guys have to snap back from that and play four quarters this week or they’ll get blown out again. I can’t say it any plainer than that. Turnovers’ll — aw, never mind! Yeah, though, let’s talk about turnover prone Devin Gardner versus turnover prone Christian Hackenberg. Well, let’s broaden it out to team versus team. Penn State has lost the ball nine times this year while Michigan has barfed it to the opposition twelve times. However, Michigan has gotten the ball on turnover nine times, while Penn State has done so only six times. They’re both equally sucky in net turnover ratio. The weekend weather looks a-ight, and should be no great influence on the game’s outcome. Our Nittany Turkey weatherman calls for claaady (which is how it’s pronounced in dahntahn Pittsburgh) with a high around 63°F/17ºC. O’Brien went all St. Joe at the press conference, getting crotchety with the media guys about their continuing need to harp on the Indiana loss. I think the loss really got to him. The main thing is that, as I mentioned above, the team stays motivated and plays up to their ability. They have nothing to play for but their pride, but that’s a myopic view. What they have to play for is providing an incentive for recruits to consider Penn State. The sanctions are enough of a great big major huge humongous impediment to recruiting without the team sucking completely, looking like a latter day Indiana. (Funny how the worm turns.) Motivation, motivation, motivation! It starts and ends with O’Brien. The projected sellout crowd of 108,000 in full stadium whiteout mode is certainly an incentive to excel. It can also be a daunting experience for the rookies. But it’ll be noisy and Michigan’s offense will be discombobulated by the hyperpartisan atmosphere, as usual. Who’s Who from Big Blue? Today’s featured opponent alumnus was the 38th President of the United States, Gerald R. “Jerry” Ford, Jr., who became president upon the resignation of Richard M. Nixon in 1974 and served until Inauguration Day 1977. He was narrowly defeated in the 1976 election by Jimmy Carter. He was appointed by Nixon as Vice President in the aftermath of the disgraced Spiro Agnew’s resignation in 1973. Before serving as V.P., Ford served in the U.S. House of Representatives for 25 years, eight of them as the Republican Minority Leader. Jerry lived to the ripe old age of 93, and remains the longest living U.S. president. 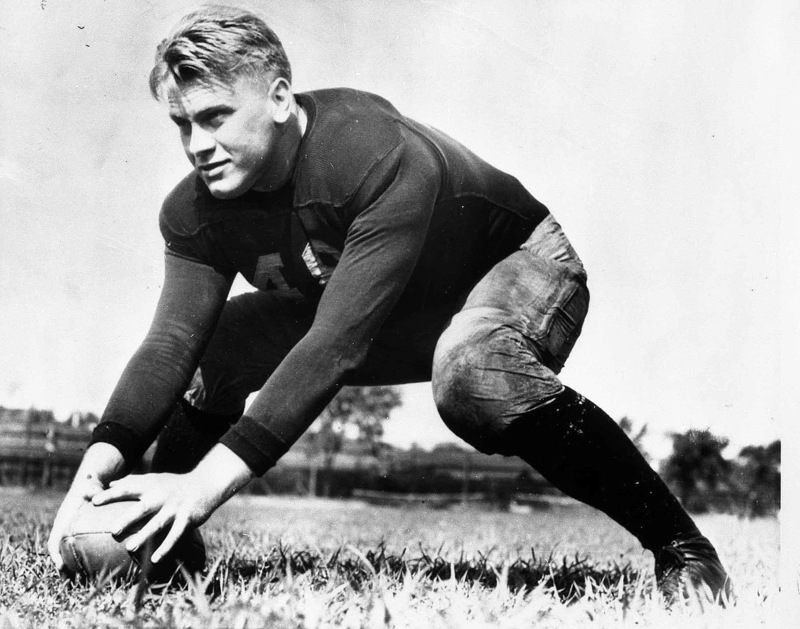 Ford played center and linebacker for the Wolverines, back in the days of 60-minute men. He’s became only future U.S. president to have ever tackled a future Heisman Trophy winner when he tackled Jay Berwanger in a game against the University of Chicago. The University of Michigan retired Jerry’s jersey #48 in 1994, but with the consent of the Ford family it was restored to active use in 2012 and is now worn by junior linebacker Desmond Morgan, who in his last outing had six solo tackles and four assists against Minnesota. I briefly had the idea that I could rap out the Official Turkey Poop Prediction, but I’ve thought better of it. I’m not very good at hip-hop rhyming. Perhaps one of my six readers can teach me how to do it. But this game is pretty ooga booga in that this turkey is not getting a very clear picture in his crystal ball, which developed some cracks around last week this time. How am I doing thus far this season? Funny you should ask, because I’m going to tell you. The damn bloom is off the rose. I’m 4-1 straight up, 4-1 against the spread, and 4-1 on the over/under. That wouldn’t be bad for ordinary humans, but this is the Nittany Turkey we’re talking about here. You and I expect better from this foul old fowl. Looking west toward Sin City, the gamblers have thrown enough money around to establish a trend, favoring Michigan by three at the moment, with an over/under of 51. For those of you who are mathematically challenged, this works out to a 27-24 expected Michigan win. But there’s so much ooga booga (read “ifs”) going on with this game that I don’t know whether expectations mean anything. I think anything goes here. Which Michigan team will show up here? The one that put 41 on ND or the one that could muster only 24 against UConn. Which Penn State team will show up here? I can’t really ask that because there are many more variations than could be described — it is a team still trying to find itself. However, it has a vulnerable defense, and defense is what is needed in the Big Ten to achieve success. Michigan has allowed only 19.4 points per game and they seem to be able to outlast opponents even when things look bad at the end, like with Akron and UConn. Besides, they have the Little Brown Jug and they know how to use it. Michigan 37, Penn State 17. Take the over.